Upper: adiTUFF for best abrasion resistance in the toe area. 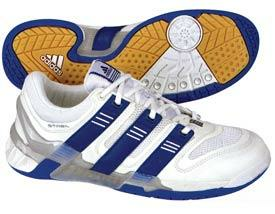 Synthetic leather upper for light weight and durability. Midsole: 3-D TORSION for best midfoot integrity. adiPRENE provides protection from harmful impact forces. adiPRENE+ insert for forefoot propulsion and efficiency. Encapsulated midsole construction for enhanced fit and support.